OTC Pepcid is recaptured from rejected blister cards. Savings paid for two machines in two months. Two deblistering machines helped improve batch yields so much for J&J Merck, Camp Hill, PA, they paid for themselves in two months. Installed at J&J Merck's Lancaster, PA facility, the deblistering machines recapture OTC Pepcid from rejected blister packs. The machines carefully perforate blisters and remove tablets which are then inspected and returned to the infeed hopper. Because the tablets return to the filler so quickly, batch yields increase savings per shift, adding up to savings of about $50,000 per month. Charlie Love, Senior Packaging Engineer, J&J Merck, managed the deblistering project. "The two machines speed up recapturing rejects from the thermoformers. They increase batch yields by putting more product into the system. And they recover product in real time - there's no rework afterwards." The deblistering machines are installed next to the reject chute of the thermoformers. When a number of blisters collect in the reject bins, operators stack the blisters in the infeed magazines of the deblistering machines. Pepcid is recovered from each machine at a rate of 77 blisters per minute. Mr. Deblister™ Product Recovery machines are manufactured by Gemel Precision Tool Co., Ivyland, PA. The design enables the machines to recover tablets from push-through and child resistant blister cards as well as foil-foil and blister cards with stiffening ribs. The machines recover product so quickly because they handle each blister card individually. Blister cards are placed into a magazine. A vacuum cup then pulls an individual blister card out of the magazine rails and onto it's own nest plate for transfer through the machine. The blister card is then moved to the perforation station. The lower perforation stripper drives through the nest plate and lifts the blister card toward the perforation tool. As the blister is lifted, the sides of the individual blisters touch the tapered wall of the upper perforation tool. This situates the blister card into the proper position for accurate knife penetration. The knife penetrates the blister lidding to a depth of .04 to .08 inches (one to two mm) but does not damage the tablet inside. After perforation, the blister card is indexed to the knockout station. Once again the blister is lifted upwards into the upper knockout tool." The blisters are inverted at the product push-out station", says Klaus Gehlert, President, Gemel Precision Tool. "The perforated lidding opens like a flap and product comes out of the package and down a chute. The empty blister card continues down the line where it is knocked out of the nest plate into a waste receptacle." The transport plate continues to index to the pre-magazine station where an optical sensor checks to assure the empty blister has been rejected. If the blister has been removed, the transport plate indexes to station one and the cycle begins again. 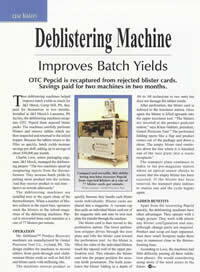 Apart from recovering Pepcid quickly, the deblistering machines have other advantages. They operate with a single person. They work almost any blister configuration and size, although change parts are required. Product and scrap are kept separated. And their small footprint makes them easy to maneuver close to the thermoforming lines. According to Love, the machines had little difficulty passing all three validation phases. He would consider using more if the need arises in the future.